Since there are still some ferias left this week, on which last Sunday's Mass will be repeated, it is not, perhaps, too late to add a few words about that Mass. Back in the days when the main purpose of a Roman Pontiff was the solemn celebration of the Sacred Liturgy, on the Second Sunday in Advent he processed to his 'Stational Church', the Church of the Holy Cross, in order to offer the Holy Sacrifice. This is the Church which was in the residence of Constantine's mother, S Helen of Colchester. Soil had been brought from Jerusalem and the Church had risen above it; in it the Empress had deposited the relics of the Cross and other relics of the Crucifixion which she had brought from Jerusalem. In Willis' words, "it was intended to represent in Rome the sacred sites of the Holy City", and, as the Liber Pontificalis puts it, "cognominatur usque in hodiernum diem Hierusalem". That identification left profound marks on this week's Mass texts. 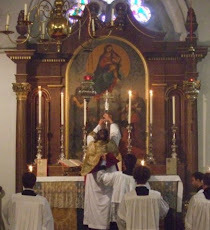 The Introit, which has miraculously survived even into the Novus Ordo, is loosely based on Isaias 30: O people of Sion, behold, the Lord will come to save the Gentiles, and the Lord will make the glory of his voice heard in the joy of your heart. Jewry is told that YHWH is coming to his people, and will save the Gentiles. This is a fine Biblical theme and one not commonly heard in modern preaching! Jewry is the people of YHWH, and his promises still abide with that Faithful Remnant of his people which recognised the Day of its Visitation, and also with the Gentiles who through the grace and election of the God of Israel have received him by Faith and share his Promises. As Dom Gueranger sums it up, "Christ brings Jews and Gentiles into the one same family. Glory to this Sovereign King, the powerful offspring of the root of Jesse!" The Epistle from Romans 15 reminds us that the Jewish Scriptures were given for our edification. Christ Jesus, this passage goes on, was God's diakonos to the Jews so as to confirm the Promises made to the Patriarchs, and so that the Gentiles will glorify God. I commend this entire passage to prayerful study. The ancient Gradual/Alleluia is based upon Psalms 49/50 and 121/122: His beauty comes from Sion; our God will manifestly come; I was glad when they said unto me, we will go into the House of the Lord. Baruch supplies the Communio: Jerusalem, arise and stand on high; and behold the joy which will come to you from your God. There is nothing here of the accusations that a whole race was to be for ever guilty of Deicide, accusations which so polluted some Medieval Christian minds. And there is nothing of the foolish but fashionable babble of some modern so-called Catholic 'thinkers' for whom their first obligation is to fawn obsequiously upon representatives of the rabbinic Judaism of the Synagogue, showering them with lavish and guilt-ridden assurances that they are in no danger of our wicked 'proselytism'. They went their way; may God most abundantly bless them and, at the End, bring them home. We, in the same Faith which our Patriarch Abraham had before he was circumcised, still go up to God's House to approach YHWH with a Sacrifice. I offered him a Lamb this morning about three hours ago. Father, do you have any recommendations for Commentaries on the Epistle to the Romans. I read it a while back with the missus and we were lost in a sea of rabbinical thought, unable to understand most of the leaps that the Apostle to the Gentiles made. I have often wondered about rabbinic synagogue Judaism. It seems to me in somewhat of a parallel to the later development of Protestant Christianity they have jettisoned whole chunks of their original faith specifically the Temple sacrifices that were ordained by God himself. From a Catholic perspective they were no longer needed as the one sacrifice at Calvary took care of that for all time. But how do they justify it? Jonathan: as a Jew who converted to Christianity, was an Evangelical for 28 years and then became a Catholic, I agree: you're quite right about the resemblance between Protestantism and post-Temple Judaism. But Jews didn't jettison the sacrifices voluntarily, as I'm sure you'll remember: the Temple was destroyed by the Romans (as predicted by our Lord) in AD 70, and without the Temple, there couldn't be any sacrifices. Jonathan: interesting parallel, but as Sue says, whereas the Protestants abandoned the Holy Sacrifice voluntarily, Jews were rather forcefully compelled to abandon their sacrifice - which couldn't be offered anywhere except in the Temple in Jerusalem. Hence, their contempt for the Samaritan one on Mt. Garizim (?). Extreme Protestants with their contempt for Catholic ritual should consider that the Apostles continued to attend the fully-functioning Temple even when the Perfect Sacrifice had already been established and was celebrated by them. Not that they consider the Apostles did that, of course. What is the CDF for? "Saint John Henry Newman, Doctor of the Church"